Our VBS this year was Lifting Up the King. We studied some great kings of the Bible: David, Solomon, Josiah and Jesus. Jesus being the greatest King of all. This is the first night's study of King David: A Man After God's own Heart found in Acts 13:22. The theme was Heart Like God. I decorated each wall for a different person. I planned to make each wall a throne room, but as I worked on them, I only made David and Solomon in a throne room. Click here to download the kings graphics. I made 2 different banners for each person. These are close-ups before they were attached to the dowel rods. I used poster board, but you can use felt, fabric, bulletin board paper, etc. I painted the designs, but you could use markers, chalk, etc. Then I added jewels for sparkle for VBS. Click here to see more with the free templates (plain and mine). For our VBS lessons, I taught a brief overview of each king's life. Some of the facts are to help students remember (or learn) some of the basics of their life, and part of the discussion is to learn why they were great kings. For David, we discussed Goliath and some of David's traits before and after he was the king. I used these visuals on the back of the door so I could use them for reference teaching David & Solomon. I made the title using an overhead projector to enlarge my graphic onto poster board and then painting it. After the red paint was dry for the lettering, I added Glitter Glue and once it is dry, it makes this great shiny glittery effect! The jewels were added last. I had the kings posters printed on bigger computer paper (10x13?) and laminated them. You can download title templates and the kings posters here. Application Game: Paulette creates with the games and this was fun! I printed 2 of the Goliaths. We divided the kids up into 2 groups and when they knocked Goliath down, everyone shouted "The battle is the Lord's!" I took a close-up of the slingshot that Bill made for us (you need 2). I don't have directions, but it seems doable by looking at the photo. The blue and green slingshots were purchased art Target. Another way to reinforce: 'Aim to be like David: With a Heart Like God'. Use different words that are what God wants us to be like. Use a slingshot to throw the marshmallows at Goliath. Download the Goliaths here. From a previous post, I made these for a take home. 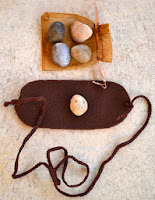 I used blue felt and laid the smooth stones in the 'brook'. They picked up their 5 smooth stones like David. Download the template for the slingshots here. I used these Magnetic Board Visuals for VBS. I wanted something different and they hold the student's interest. To use these, print (on cardstock if possible), cut out, laminate and add magnets on the back. As you are teaching the lesson, you just add the numbered graphic. Click here to download these visuals. Click here to download the lesson to use with these visuals. This lesson has the corresponding numbers to use with these visuals and is the same lesson as below. Click here to download the Visual Aids. Click here to download the Pictures to Color. Click here to see more for David. Click here to see more for David for preschool.